DIE Martis, videlicet, 26 die Aprilis. L. Keeper communicates a Letter and Message from the King to the House. Message from the King, about His being refused Admittance into Hull by Sir John Hotham. Resolutions of the House upon this Message. The Message, and these Votes, to be communicated to the H. C.
Norton, a Minister, offers to discover the Author of a Pamphlet, intituled, A Question answered, how Laws are to be understood, and Obedience yielded. Message to the H. C. for a Conference about the King's Message, concerning His being refused Admittance into Hull. Col. Fitzwilliams Leave to transport his Family and Equipage to France. Mr. Keymes, Curate of Bermondsey, to officiate there unmolested. Lord Darcy and Conyers versus Thomas and John Savill. Lord St. Johns versus Geo. Benyon. Answer from the H. C. about the Conference on the King's Message, concerning His being refused Admittance into Hull. Conference concerning Sir Edw. Deering reported. 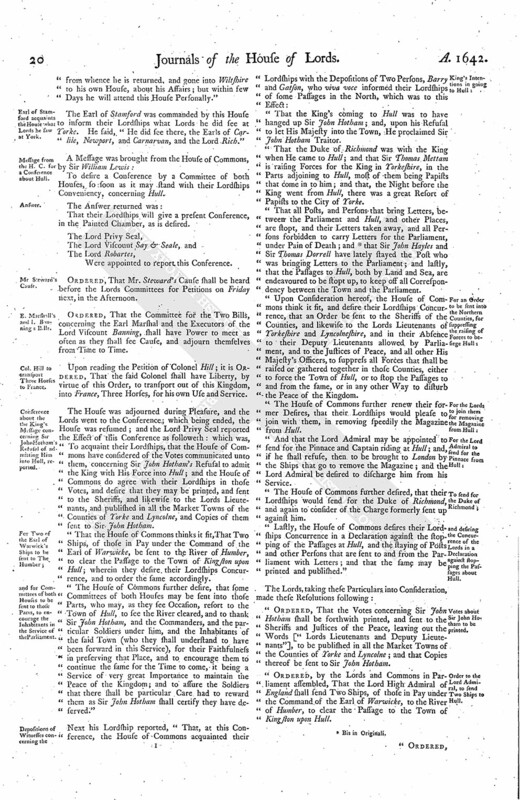 Articles of Impeachment exhibited by the Commons against him. Observations concerning Sir Ed. Deering's Behaviour. 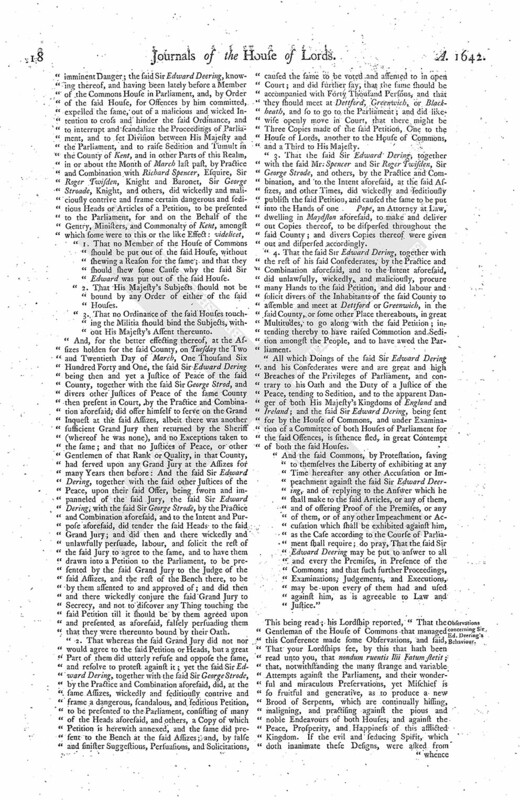 Order for Sir Edward Deering's Appearance. Col. Beeling committed to The Tower. Bill for punishing scandalous Clergymen. Earl of Stamford returns from York, and acquaints the House that Lord Seymour will shortly attend. Earl of Stamford acquaints the House what Lords he saw at York. Message from the H. C. for a Conference about Hull. E. Marshall's and L Banning's Bills. Col. Hill to transport Three Horses to France. Conference about the King's Message concerning Sir John Hotham's Refusal of admitting Him into Hull, reported. and for Committees of both Houses to be sent to those Parts, to encourage the Inhabitants in the Service of the Parliament. and desiring the Concurrence of the Lords in a Declaration against stopping the Passages about Hull. Votes about Sir John Hotham to be printed. Order to the Lord Admiral, to send Two Ships to Hull. Order to send the Earl of Stamford and the Lord Willoughby to Hull. With a Committee of the H.C.
Order to suppress the raising of Forces intended for besieging Hull, etc. Order to send Ships to remove the Magazine from Hull. Order to send for the Pinnace at Hull. 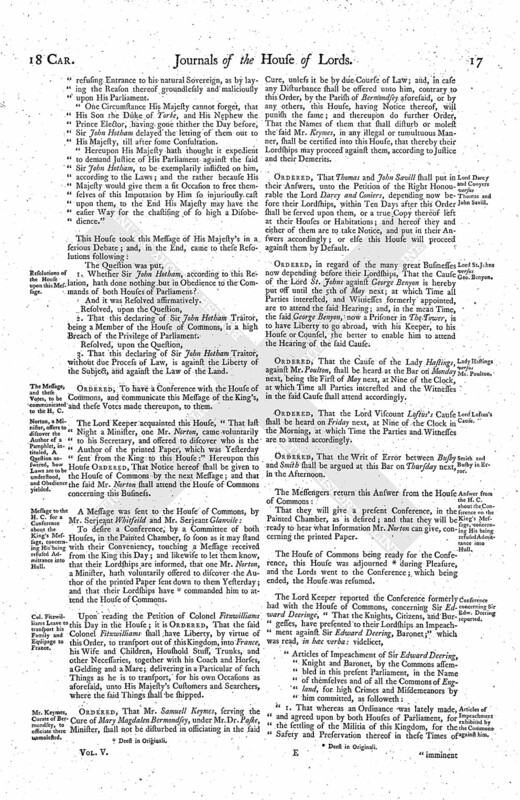 Declaration against stopping the Passages about Hull. For expediting the Propositions for the Sea Adventure for Ireland. To expedite the raising Ten Thousand Men for Ireland. That Sir Thomas Dorrell, Sir John Hales, etc may be sent for, for being active against the Parliament. And to desire the Lords to sit To morrow after Divine Service, although it is Fast Day. Orders upon these Particulars of the Message. Grievances and Remedies to be considered. The Lord Keeper acquainted the House, "That he had received a Letter, wherein is inclosed a Message from the King; which he is commanded to communicate to both Houses of Parliament." "Right Trusty and Well-beloved Counsellor, We greet you well. Our Will and Command is, That, forthwith, upon Receipt of these Our Letters, you deliver to be read in Our House of Peers, and after communicated to Our House of Commons, Our Message inclosed, concerning Sir John Hotham's Refusal to give Us Entrance into Our Town of Hull; and for so doing, this shall be your Warrant. "Given at Our Court at Beaverley, the 24th of April, 1642. "His Majesty, having received the Petition inclosed from most of the chief of the Gentry near about Yorke, desiring the Stay of His Majesty's Arms and Ammunition in His Magazine at Hull (for the Safety not only of His Majesty's Person and Children, but likewise of all these Northern Parts, the manifold Rumours of great Dangers inducing them to make their said Supplication), thought it most fit to go Himself in Person to His Town of Hull, to view His Arms and Ammunition there, that thereupon He might give Directions what Part thereof might be necessary to remain there, for the Security and Satisfaction of His Northern Subjects; and what Part thereof might be spared for Ireland, the arming of His Majesty's Scotts Subjects that are to go thither, or to replenish his chiefest Magazine of The Tower of London; where being come upon the 23d of this Instant April, much contrary to his Expectation, He found all the Gates shut upon Him, and the Bridges drawn up, by the express Command of Sir John Hotham, who for the present commands a Garrison there, and from the Walls flatly denied His Majesty Entrance into his said Town; the Reason of the said Denial being as strange to His Majesty as the Thing itself, it being, That he could not admit His Majesty without Breach of Trust to His Parliament; which did the more incense His Majesty's Anger against him, for that he most seditiously and traiterously would have put his Disobedience upon His Majesty's Parliament; which His Majesty being willing to clear, demanded of him if he had the Impudence to aver that the Parliament had directed him to deny His Majesty Entrance; and that, if he had any such Order, that he would shew it in Writing, for otherwise His Majesty could not believe it; which he could no ways produce, but maliciously made that false Interpretation according to his own Inferences, confessing that he had no such positive Order, which His Majesty was ever confident of: But His Majesty, not willing to take so much Pains in vain, offered to come into that His Town only with Twenty Horse, finding that the main of his Pretence lay, that His Majesty's Train was able to command the Garrison: Notwithstanding, His Majesty was so desirous to go thither in a private Way, that he gave Warning thereof but Over-night; which he refusing, but by way of Condition (which His Majesty thought much below Him), held it most necessary to declare him Traitor (unless upon better Thoughts he should yield Obedience), which he doubly deserved, as well for refusing Entrance to his natural Sovereign, as by laying the Reason thereof groundlessly and maliciously upon His Parliament. "One Circumstance His Majesty cannot forget, that His Son the Duke of Yorke, and His Nephew the Prince Elector, having gone thither the Day before, Sir John Hotham delayed the letting of them out to His Majesty, till after some Consultation. "Hereupon His Majesty hath thought it expedient to demand Justice of His Parliament against the said Sir John Hotham, to be exemplarily inflicted on him, according to the Laws; and the rather because His Majesty would give them a fit Occasion to free themselves of this Imputation by Him so injuriously cast upon them, to the End His Majesty may have the easier Way for the chastising of so high a Disobedience." 1. Whether Sir John Hotham, according to this Relation, hath done nothing but in Obedience to the Commands of both Houses of Parliament? And it was Resolved affirmatively. 2. That this declaring of Sir John Hotham Traitor, being a Member of the House of Commons, is a high Breach of the Privilege of Parliament. 3. That this declaring of Sir John Hotham Traitor, without due Process of Law, is against the Liberty of the Subject, and against the Law of the Land. Ordered, To have a Conference with the House of Commons, and communicate this Message of the King's, and these Votes made thereupon, to them. The Lord Keeper acquainted this House, "That last Night a Minister, one Mr. Norton, came voluntarily to his Secretary, and offered to discover who is the Author of the printed Paper, which was Yesterday sent from the King to this House:" Hereupon this House Ordered, That Notice hereof shall be given to the House of Commons by the next Message; and that the said Mr. Norton shall attend the House of Commons concerning this Business. 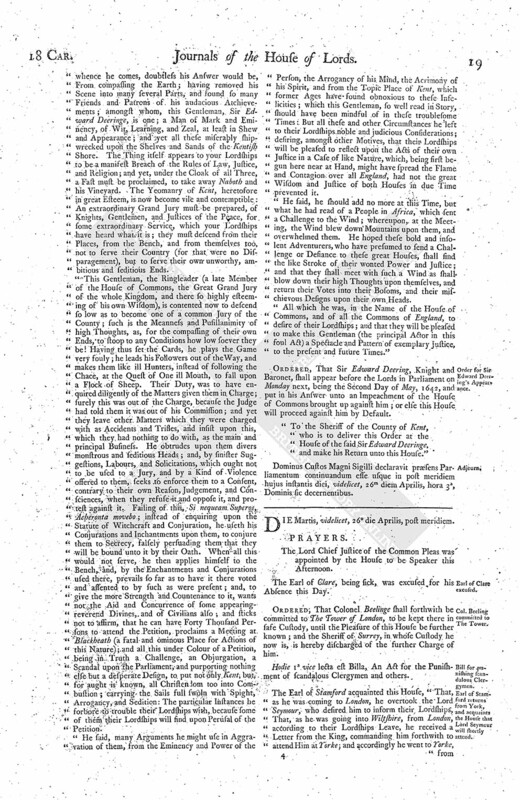 To desire a Conference, by a Committee of both Houses, in the Painted Chamber, so soon as it may stand with their Conveniency, touching a Message received from the King this Day; and likewise to let them know, that their Lordships are informed, that one Mr. Norton, a Minister, hath voluntarily offered to discover the Author of the printed Paper sent down to them Yesterday; and that their Lordships have (fn. 1) commanded him to attend the House of Commons. Upon reading the Petition of Colonel Fitzwilliams this Day in the House; it is Ordered, That the said Colonel Fitzwilliams shall have Liberty, by virtue of this Order, to transport out of this Kingdom, into France, his Wife and Children, Houshold Stuff, Trunks, and other Necessaries, together with his Coach and Horses, a Gelding and a Mare; delivering in a Particular of such Things as he is to transport, for his own Occasions as aforesaid, unto His Majesty's Customers and Searchers, where the said Things shall be shipped. Ordered, That Mr. Samuell Keymes, serving the Cure of Mary Magdalen Bermondsey, under Mr. Dr. Paske, Minister, shall not be disturbed in officiating in the said Cure, unless it be by due Course of Law; and, in case any Disturbance shall be offered unto him, contrary to this Order, by the Parish of Bermondsey aforesaid, or by any others, this House, having Notice thereof, will punish the same; and thereupon do further Order, That the Names of them that shall disturb or molest the said Mr. Keymes, in any illegal or tumultuous Manner, shall be certified into this House, that thereby their Lordships may proceed against them, according to Justice and their Demerits. Ordered, That Thomas and John Savill shall put in their Answers, unto the Petition of the Right Honourable the Lord Darcy and Coniers, depending now before their Lordships, within Ten Days after this Order shall be served upon them, or a true Copy thereof left at their Houses or Habitations; and hereof they and either of them are to take Notice, and put in their Answers accordingly; or else this House will proceed against them by Default. Ordered, in regard of the many great Businesses now depending before their Lordships, That the Cause of the Lord St. Johns against George Benyon is hereby put off until the 5th of May next; at which Time all Parties interested, and Witnesses formerly appointed, are to attend the said Hearing; and, in the mean Time, the said George Benyon, now a Prisoner in The Tower, is to have Liberty to go abroad, with his Keeper, to his House or Counsel, the better to enable him to attend the Hearing of the said Cause. Ordered, That the Cause of the Lady Hastings, against Mr. Poulton, shall be heard at the Bar on Monday next, being the First of May next, at Nine of the Clock, at which Time all Parties interested and the Witnesses in the said Cause shall attend accordingly. Ordered, That the Lord Viscount Loftus's Cause shall be heard on Friday next, at Nine of the Clock in the Morning, at which Time the Parties and Witnesses are to attend accordingly. Ordered, That the Writ of Error between Busby and Smith shall be argued at this Bar on Thursday next, in the Afternoon. That they will give a present Conference, in the Painted Chamber, as is desired; and that they will be ready to hear what Information Mr. Norton can give, concerning the printed Paper. The House of Commons being ready for the Conference, this House was adjourned (fn. 2) during Pleasure, and the Lords went to the Conference; which being ended, the House was resumed. "1. That no Member of the House of Commons should be put out of the said House, without shewing a Reason for the same; and that they should shew some Cause why the said Sir Edward was put out of the said House. "2. That His Majesty's Subjects should not be bound by any Order of either of the said Houses. "3. That no Ordinance of the said Houses touching the Militia should bind the Subjects, without His Majesty's Assent thereunto. "And, for the better effecting thereof, at the Assizes holden for the said County, on Tuesday the Two and Twentieth Day of March, One Thousand Six Hundred Forty and One, the said Sir Edward Dering being then and yet a Justice of Peace of the said County, together with the said Sir George Strod, and divers other Justices of Peace of the same County then present in Court, by the Practice and Combination aforesaid, did offer himself to serve on the Grand Inquest at the said Assizes, albeit there was another sufficient Grand Jury then returned by the Sheriff (whereof he was none), and no Exceptions taken to the same; and that no Justices of Peace, or other Gentlemen of that Rank or Quality, in that County, had served upon any Grand Jury at the Assizes for many Years then before: And the said Sir Edward Dering, together with the said other Justices of the Peace, upon their said Offer, being sworn and impanneled of the said Jury, the said Sir Edward Dering, with the said Sir George Strode, by the Practice and Combination aforesaid, and to the Intent and Purpose aforesaid, did tender the said Heads to the said Grand Jury; and did then and there wickedly and unlawfully persuade, labour, and solicit the rest of the said Jury to agree to the same, and to have them drawn into a Petition to the Parliament, to be presented by the said Grand Jury to the Judge of the said Assizes, and the rest of the Bench there, to be by them assented to and approved of; and did then and there wickedly conjure the said Grand Jury to Secrecy, and not to discover any Thing touching the said Petition till it should be by them agreed upon and presented as aforesaid, falsely persuading them that they were thereunto bound by their Oath. "2. That whereas the said Grand Jury did not nor would agree to the said Petition or Heads, but a great Part of them did utterly refuse and oppose the same, and resolve to protest against it; yet the said Sir Edward Dering, together with the said Sir George Strode, by the Practice and Combination aforesaid, did, at the same Assizes, wickedly and seditiously contrive and frame a dangerous, scandalous, and seditious Petition, to be presented to the Parliament, consisting of many of the Heads aforesaid, and others, a Copy of which Petition is herewith annexed, and the same did present to the Bench at the said Assizes; and, by false and sinister Suggestions, Persuasions, and Solicitations, caused the same to be voted and assented to in open Court; and did further say, that the same should be accompanied with Forty Thousand Persons, and that they should meet at Dettford, Greenwich, or Blackheath, and so to go to the Parliament; and did likewise openly move in Court, that there might be Three Copies made of the said Petition, One to the House of Lords, another to the House of Commons, and a Third to His Majesty. "3. That the said Sir Edward Dering, together with the said Mr. Spencer and Sir Roger Twisden, Sir George Strode, and others, by the Practice and Combination, and to the Intent aforesaid, at the said Assizes, and other Times, did wickedly and seditiously publish the said Petition, and caused the same to be put into the Hands of one Pope, an Attorney at Law, dwelling in Maydston aforesaid, to make and deliver out Copies thereof, to be dispersed throughout the said County; and divers Copies thereof were given out and dispersed accordingly. "4. That the said Sir Edward Dering, together with the rest of his said Confederates, by the Practice and Combination aforesaid, and to the Intent aforesaid, did unlawfully, wickedly, and maliciously, procure many Hands to the said Petition, and did labour and solicit divers of the Inhabitants of the said County to assemble and meet at Dettford or Greenwich, in the said County, or some other Place thereabouts, in great Multitudes, to go along with the said Petition; intending thereby to have raised Commotion and Sedition amongst the People, and to have awed the Parliament. "All which Doings of the said Sir Edward Dering and his Confederates were and are great and high Breaches of the Privileges of Parliament, and contrary to his Oath and the Duty of a Justice of the Peace, tending to Sedition, and to the apparent Danger of both His Majesty's Kingdoms of England and Ireland; and the said Sir Edward Dering, being sent for by the House of Commons, and under Examination of a Committee of both Houses of Parliament for the said Offences, is sithence fled, in great Contempt of both the said Houses. "And the said Commons, by Protestation, saving to themselves the Liberty of exhibiting at any Time hereafter any other Accusation or Impeachment against the said Sir Edward Deering, and of replying to the Answer which he shall make to the said Articles, or any of them, and of offering Proof of the Premises, or any of them, or of any other Impeachment or Accusation which shall be exhibited against him, as the Case according to the Course of Parliament shall require; do pray, That the said Sir Edward Deering may be put to answer to all and every the Premises, in Presence of the Commons; and that such further Proceedings, Examinations, Judgements, and Executions, may be upon every of them had and used against him, as is agreeable to Law and Justice." This being read; his Lordship reported, "That the Gentleman of the House of Commons that managed this Conference made some Observations, and said, That your Lordships see, by this that hath been read unto you, that nondum ruentis Ilii Fatum Stetit; that, notwithstanding the many strange and variable Attempts against the Parliament, and their wonderful and miraculous Preservations, yet Mischief is so fruitful and generative, as to produce a new Brood of Serpents, which are continually hissing, maligning, and practising against the pious and noble Endeavours of both Houses, and against the Peace, Prosperity, and Happiness of this afflicted Kingdom. If the evil and seducing Spirit, which doth inanimate these Designs, were asked from whence he comes, doubtless his Answer would be, From compassing the Earth; having removed his Scene into many several Parts, and found so many Friends and Patrons of his audacious Archievements; amongst whom, this Gentleman, Sir Edward Deeringe, is one; a Man of Mark and Eminency, of Wit, Learning, and Zeal, at least in Shew and Appearance; and yet all these miserably shipwrecked upon the Shelves and Sands of the Kentish Shore. The Thing itself appears to your Lordships to be a manifest Breach of the Rules of Law, Justice, and Religion; and yet, under the Cloak of all Three, a Fast must be proclaimed, to take away Naboth and his Vineyard. The Yeomanry of Kent, heretofore in great Esteem, is now become vile and contemptible: An extraordinary Grand Jury must be prepared, of Knights, Gentlemen, and Justices of the Peace, for some extraordinary Service, which your Lordships have heard what it is; they must descend from their Places, from the Bench, and from themselves too, not to serve their Country (for that were no Disparagement), but to serve their own unworthy, ambitious and seditious Ends. "This Gentleman, the Ringleader (a late Member of the House of Commons, the Great Grand Jury of the whole Kingdom, and there so highly esteeming of his own Wisdom), is contented now to descend so low as to become one of a common Jury of the County; such is the Meanness and Pusillanimity of high Thoughts, as, for the compassing of their own Ends, to stoop to any Conditions how low soever they be! Having thus set the Cards, he plays the Game very souly; he leads his Followers out of the Way, and makes them like ill Hunters, instead of following the Chace, at the Quest of One ill Mouth, to fall upon a Flock of Sheep. Their Duty, was to have enquired diligently of the Matters given them in Charge; surely this was out of the Charge, because the Judge had told them it was out of his Commission; and yet they leave other Matters which they were charged with as Accidents and Trifles, and insist upon this, which they had nothing to do with, as the main and principal Business. He obtrudes upon them divers monstrous and seditious Heads; and, by sinister Suggestions, Labours, and Solicitations, which ought not to be used to a Jury, and by a Kind of Violence offered to them, seeks to enforce them to a Consent, contrary to their own Reason, Judgement, and Consciences, when they refuse it and oppose it, and protest against it. Failing of this Si nequeam Superos, Acheronta movebo; instead of enquiring upon the Statute of Witchcraft and Conjuration, he useth his Conjurations and Inchantments upon them, to conjure them to Secrecy, falsely persuading them that they will be bound unto it by their Oath. When all this would not serve, he then applies himself to the Bench, and, by the Enchantments and Conjurations used there, prevails so far as to have it there voted and assented to by such as were present; and, to give the more Strength and Countenance to it, wants not the Aid and Concurrence of some appearingreverend Divines, and of Civilians also; and sticks not to affirm, that he can have Forty Thousand Persons to attend the Petition, proclaims a Meeting at Blackheath (a fatal and ominous Place for Actions of this Nature); and all this under Colour of a Petition, being in Truth a Challenge, an Objurgation, a Scandal upon the Parliament, and purporting nothing else but a desperate Design, to put not only Kent, but, for aught is known, all Christendom too into Combustion; carrying the Sails full swoln with Spight, Arrogancy, and Sedition: The particular Instances he forbore to trouble their Lordships with, because some of them their Lordships will find upon Perusal of the Petition. "He said, many Arguments he might use in Aggravation of them, from the Eminency and Power of the Person, the Arrogancy of his Mind, the Acrimony of his Spirit, and from the Topic Place of Kent, which former Ages have found obnoxious to these Infelicities; which this Gentleman, so well read in Story, should have been mindful of in these troublesome Times: But all these and other Circumstances he left to their Lordships noble and judicious Considerations; desiring, amongst other Motives, that their Lordships will be pleased to reflect upon the Acts of their own Justice in a Case of like Nature, which, being first begun here near at Hand, might have spread the Flame and Contagion over all England, had not the great Wisdom and Justice of both Houses in due Time prevented it. "He said, he should add no more at this Time, but what he had read of a People in Africa, which sent a Challenge to the Wind; whereupon, at the Meeting, the Wind blew down Mountains upon them, and overwhelmed them. He hoped these bold and insolent Adventurers, who have presumed to send a Challenge or Defiance to these great Houses, shall find the like Stroke of their wonted Power and Justice; and that they shall meet with such a Wind as shall blow down their high Thoughts upon themselves, and return their Votes into their Bosoms, and their mischievous Designs upon their own Heads. "All which he was, in the Name of the House of Commons, and of all the Commons of England, to desire of their Lordships; and that they will be pleased to make this Gentleman (the principal Actor in this foul Act) a Spectacle and Pattern of exemplary Justice, to the present and future Times." Ordered, That Sir Edward Deering, Knight and Baronet, shall appear before the Lords in Parliament on Monday next, being the Second Day of May, 1642, and put in his Answer unto an Impeachment of the House of Commons brought up against him; or else this House will proceed against him by Default. "To the Sheriff of the County of Kent, who is to deliver this Order at the House of the said Sir Edward Deeringe, and make his Return unto this House." Dominus Custos Magni Sigilli declaravit præsens Parliamentum continuandum esse usque in post meridiem hujus instantis diei, videlicet, 26m diem Aprilis, hora 3a, Dominis sic decernentibus. The Earl of Clare, being sick, was excused for his Absence this Day. Ordered, That Colonel Beelinge shall forthwith be committed to The Tower of London, to be kept there in safe Custody, until the Pleasure of this House be further known; and the Sheriff of Surrey, in whose Custody he now is, is hereby discharged of the further Charge of him. Hodie 1a vice lecta est Billa, An Act for the Punishment of scandalous Clergymen and others. The Earl of Stamford acquainted this House, "That, as he was coming to London, he overtook the Lord Seymour, who desired him to inform their Lordships, That, as he was going into Wiltshire, from London, according to their Lordships Leave, he received a Letter from the King, commanding him forthwith to attend Him at Yorke; and accordingly he went to Yorke, from whence he is returned, and gone into Wiltshire to his own House, about his Affairs; but within few Days he will attend this House Personally." The Earl of Stamford was commanded by this House to inform their Lordships what Lords he did see at Yorke. He said, "He did see there, the Earls of Carlile, Newport, and Carnarvan, and the Lord Rich." To desire a Conference by a Committee of both Houses, so soon as it may stand with their Lordships Conveniency, concerning Hull. Were appointed to report this Conference. Ordered, That Mr. Steward's Cause shall be heard before the Lords Committees for Petitions on Friday next, in the Afternoon. Ordered, That the Committee for the Two Bills, concerning the Earl Marshal and the Executors of the Lord Viscount Banning, shall have Power to meet as often as they shall see Cause, and adjourn themselves from Time to Time. Upon reading the Petition of Colonel Hill; it is Ordered, That the said Colonel shall have Liberty, by virtue of this Order, to transport out of this Kingdom, into France, Three Horses, for his own Use and Service. The House was adjourned during Pleasure, and the Lords went to the Conference; which being ended, the House was resumed; and the Lord Privy Seal reported the Effect of this Conference as followeth: which was, "To acquaint their Lordships, that the House of Commons have considered of the Votes communicated unto them, concerning Sir John Hotham's Refusal to admit the King with His Force into Hull; and the House of Commons do agree with their Lordships in those Votes, and desire that they may be printed, and sent to the Sheriffs, and likewise to the Lords Lieutenants, and published in all the Market Towns of the Counties of Yorke and Lyncolne, and Copies of them sent to Sir John Hotham. "That the House of Commons thinks it fit, That Two Ships, of those in Pay under the Command of the Earl of Warwicke, be sent to the River of Humber, to clear the Passage to the Town of Kingston upon Hull; wherein they desire their Lordships Concurrence, and to order the same accordingly. "The House of Commons further desire, that some Committees of both Houses may be sent into those Parts, who may, as they see Occasion, resort to the Town of Hull, to see the River cleared, and to thank Sir John Hotham, and the Commanders, and the particular Soldiers under him, and the Inhabitants of the said Town (who they shall understand to have been forward in this Service), for their Faithfulness in preserving that Place, and to encourage them to continue the same for the Time to come, it being a Service of very great Importance to maintain the Peace of the Kingdom; and to assure the Soldiers that there shall be particular Care had to reward them as Sir John Hotham shall certify they have deserved." "That the King's coming to Hull was to have hanged up Sir John Hotham; and, upon his Refusal to let His Majesty into the Town, He proclaimed Sir John Hotham Traitor. "That the Duke of Richmond was with the King when He came to Hull; and that Sir Thomas Mettam is raising Forces for the King in Yorkeshire, in the Parts adjoining to Hull, most of them being Papists that come in to him; and that, the Night before the King went from Hull, there was a great Resort of Papists to the City of Yorke. "That all Posts, and Persons that bring Letters, between the Parliament and Hull, and other Places, are stopt, and their Letters taken away, and all Persons forbidden to carry Letters for the Parliament, under Pain of Death; and (fn. 3) that Sir John Hayles and Sir Thomas Dorrell have lately stayed the Post who was bringing Letters to the Parliament; and lastly, that the Passages to Hull, both by Land and Sea, are endeavoured to be stopt up, to keep off all Correspondency between the Town and the Parliament. "Upon Consideration hereof, the House of Commons think it fit, and desire their Lordships Concurrence, that an Order be sent to the Sheriffs of the Counties, and likewise to the Lords Lieutenants of Yorkeshire and Lyncolneshire, and in their Absence to their Deputy Lieutenants allowed by Parliament, and to the Justices of Peace, and all other His Majesty's Officers, to suppress all Forces that shall be raised or gathered together in those Counties, either to force the Town of Hull, or to stop the Passages to and from the same, or in any other Way to disturb the Peace of the Kingdom. "The House of Commons further renew their former Desires, that their Lordships would please to join with them, in removing speedily the Magazine from Hull. "And that the Lord Admiral may be appointed to send for the Pinnace and Captain riding at Hull; and, if he shall refuse, then to be brought to London by the Ships that go to remove the Magazine; and the Lord Admiral be desired to discharge him from his Service. "The House of Commons further desired, that their Lordships would send for the Duke of Richmond, and again to consider of the Charge formerly sent up against him. "Lastly, the House of Commons desires their Lordships Concurrence in a Declaration against the stopping of the Passages at Hull, and the staying of Posts and other Persons that are sent to and from the Parliament with Letters; and that the same may be printed and published." "Ordered, That the Votes concerning Sir John Hotham shall be forthwith printed, and sent to the Sheriffs and Justices of the Peace, leaving out the Words ["Lords Lieutenants and Deputy Lieutenants"], to be published in all the Market Towns of the Counties of Yorke and Lyncolne; and that Copies thereof be sent to Sir John Hotham. "Ordered, by the Lords and Commons in Parliament assembled, That the Lord High Admiral of England shall send Two Ships, of those in Pay under the Command of the Earl of Warwicke, to the River of Humber, to clear the Passage to the Town of Kingston upon Hull. "Ordered, by the Lords and Commons in Parliament assembled, That the Earl of Stamford and the Lord Willoughbie of Parham shall, with a proportionable Number of the House of Commons, resort to the Town of Hull, as well to thank Sir John Hotham, and the Commanders and the particular Soldiers under him, and the Inhabitants of the said Town, who they shall understand to have been forward in this Service, for their Faithfulness in preserving that Place, and to encourage them to continue the same for the Time to come, it being a Service of very great Importance to maintain the Peace of the Kingdom; and to assure the Soldiers, that there shall be particular Care had to reward them, as Sir John Hotham shall certify they have deserved. 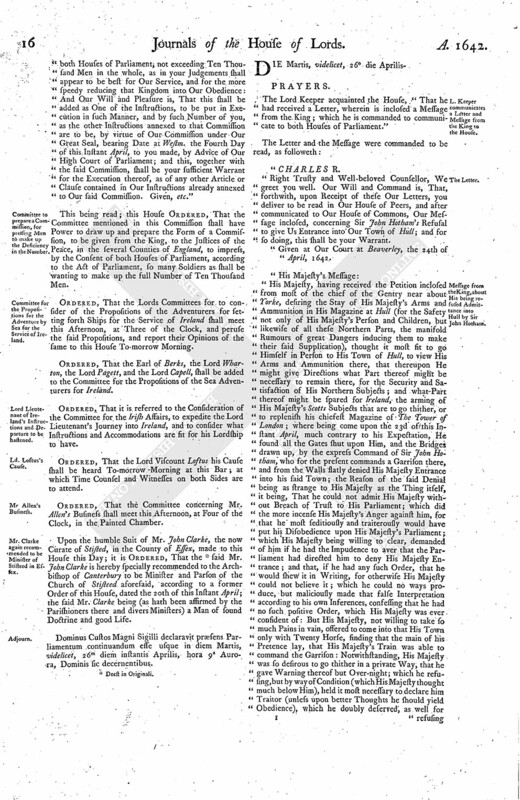 "Ordered, by the Lords and Commons in Parliament assembled, That the Sheriffs of the Counties of Yorke and Lyncolne, and likewise the Lords Lieutenants of the same Counties, and in their Absence their Deputies allowed by the Parliament, and the Justices of the Peace, and all other His Majesty's Officers, shall suppress all Forces that shall be raised or gathered together in those Counties, either to force the Town of Hull, to stop the Passages to and from the same, or any other Way to disturb the Peace of the Kingdom. And further it is Ordered, That this Order shall be printed and published forthwith. "Ordered, That the Lord Admiral shall send so many Ships to Hull, to remove the Magazine from thence to The Tower of London, as he shall think fit and convenient. "Ordered, That the Lord High Admiral of England shall send for the Pinnace and Captain riding at Hull; and, if he shall refuse to come, then that he and the said Pinnace shall be brought to London, by the Ships that go to remove the Magazine; and if in Case he shall refuse to come, then the Lord Admiral is hereby required to discharge him from his said Place." 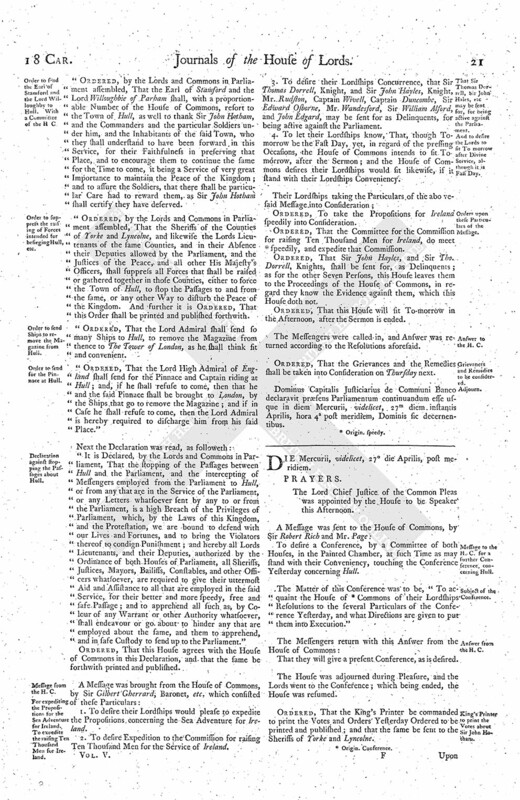 "It is Declared, by the Lords and Commons in Parliament, That the stopping of the Passages between Hull and the Parliament, and the intercepting of Messengers employed from the Parliament to Hull, or from any that are in the Service of the Parliament, or any Letters whatsoever sent by any to or from the Parliament, is a high Breach of the Privileges of Parliament, which, by the Laws of this Kingdom, and the Protestation, we are bound to defend with our Lives and Fortunes, and to bring the Violators thereof to condign Punishment; and hereby all Lords Lieutenants, and their Deputies, authorized by the Ordinance of both Houses of Parliament, all Sheriffs, Justices, Mayors, Bailiffs, Constables, and other Officers whatsoever, are required to give their uttermost Aid and Assistance to all that are employed in the said Service, for their better and more speedy, free and safe Passage; and to apprehend all such as, by Colour of any Warrant or other Authority whatsoever, shall endeavour or go about to hinder any that are employed about the same, and them to apprehend, and in safe Custody to send up to the Parliament." Ordered, That this House agrees with the House of Commons in this Declaration, and that the same be forthwith printed and published. 1. To desire their Lordships would please to expedite the Propositions concerning the Sea Adventure for Ireland. 2. To desire Expedition to the Commission for raising Ten Thousand Men for the Service of Ireland. 3. To desire their Lordships Concurrence, that Sir Thomas Dorrell, Knight, and Sir John Hayles, Knight, Mr. Rudston, Captain Wivell, Captain Duncombe, Sir Edward Osborne, Mr. Wandesford, Sir William Alford, and John Edgard, may be sent for as Delinquents, for being active against the Parliament. 4. To let their Lordships know, That, though Tomorrow be the Fast Day, yet, in regard of the pressing Occasions, the House of Commons intends to sit Tomorrow, after the Sermon; and the House of Commons desires their Lordships would sit likewise, if it stand with their Lordships Conveniency. Ordered, To take the Propositions for Ireland speedily into Consideration. Ordered, That the Committee for the Commission for raising Ten Thousand Men for Ireland, do meet (fn. 4) speedily, and expedite that Commission. Ordered, That Sir John Hayles, and Sir Tho. Dorrell, Knights, shall be sent for, as Delinquents; as for the other Seven Persons, this House leaves them to the Proceedings of the House of Commons, in regard they know the Evidence against them, which this House doth not. Ordered, That this House will fit To-morrow in the Afternoon, after the Sermon is ended. The Messengers were called in, and Answer was returned according to the Resolutions aforesaid. Ordered, That the Grievances and the Remedies shall be taken into Consideration on Thursday next. Dominus Capitalis Justiciarius de Communi Banco declaravit præsens Parliamentum continuandum esse usque in diem Mercurii, videlicet, 27m diem instantis Aprilis, hora 4a post meridiem, Dominis sic decernentibus.